HIIT: High Intensity Interval Training is the greatest way to burn fat by doing LESS cardio! HIIT is a VERY effective training technique used to decrease body fat, increase speed, increase VO2 Max and best of all: It requires 20 minutes of your time to workout! When you complete a cardiovascular session at a static intensity for the duration of a workout your body enters a 'steady state'. This is a state at which your body has adapted itself to the speed you are going and conserves energy. When you complete HIIT you do not allow your body to enter this state and thus allow yourself to burn more total calories in less time. Also, HIIT training is performed at a high intensity which raises your heart rate faster and raises your metabolism longer after the workout. To burn the most fat, why shouldn't I run at a slow steady pace for a long time? Running for a while at a lower heart rate (60%) primarily uses fat as energy. If you train at 85% of your max heart rate you will burn more total calories and in the end: burn MORE fat. How effective is it for fat loss? (UPDATE: Many other articles dispute the validity of this research. We have provided many more research articles to support the effectiveness of HIIT on fat loss). It makes you wonder why anyone told you to train at a slow pace for a long period of time! 1. 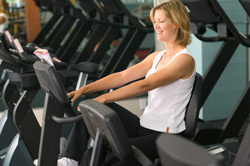 Pick any type of cardiovascular method (running, swimming, recumbent bike, treadmill, elliptical machine, etc). 2. Determine your Maximum Heart Rate or MHR should be during a hiit workout session. 3. Wear a heart rate monitor (optional). 4 . Make sure you take some time to warm up to get your body temperature raised before you begin. 5 . Now begin your cardiovascular training at 75% MHR intensity for 30 seconds and then bring your intensity down to a slow dull pace for 90 seconds. Can a beginner do it? Yes, a beginner can start HIIT but change the intensity to a lower level. This type of training is very intense and should be cleared by your doctor before you begin. Make sure that you have a protein (preferably whey) and a carbohydrate drink after this type of training to keep your nitrogen balance 'positive' and to help with recovery. To calculate what your rate should be during a hiit training or workout program you need to figure out what your maximum rate rate is and then times it by a high percentage. This will give you your bpm during a hiit session. We have done the work for you. High Intensity Interval Training is a miracle way to reduce your workout time and up your fat burning. One of the key advantages of HIIT is that it does not allow your body to adapt, so make sure to always change up the intensity and time. Another type of training principle, such as Fartlek training, is just that. Fartlek training is a random time and intensity method of training and I believe is the future of ultimate fat loss. Be prepared for HIFT (High Intensity Fartlek Training) to hit the news stands in a few months. Ok have been scouting over this site and have noticed that you guys buy into all that HIIT stuff. Being a personal trainer and a private track team coach here in Washington have found that to be only partially true. From the research that I have found that it burns fat faster but there is a draw back. It is a lot higher risk of becoming injured to those that are injury prone and are of over weight. One wrong quick movement and you will mess up your knees for the rest of your life. I know that from experience. Distance running has been proven to do the same in a longer period of time. Yes, people always want to lose fat the fastest way but a running routine that that they can for 20-30 minutes three times a week will be better on the body in the long run. Another thing to note is that distance running is once accepted is a great way to clear your head so that once you are done you can go about your day with a smile upon your face. 1. Talanian JL, Galloway SD, Heigenhauser GJ, Bonen A, Spriet LL. 2. Exercise Metabolism Research Group, Dept. of Kinesiology, McMaster University, Hamilton, Ontario, Canada L8S 4K1. HIIT IS a time efficient way to complete your cardio sessions for an intermediate to advanced trainer whose goal is to increase muscle mass and burn fat (period). If your goal is to train for a triathalon, marathon, 10k, or training for an endurance sport OR have the time to commit to LSD then HIIT isn't for you.